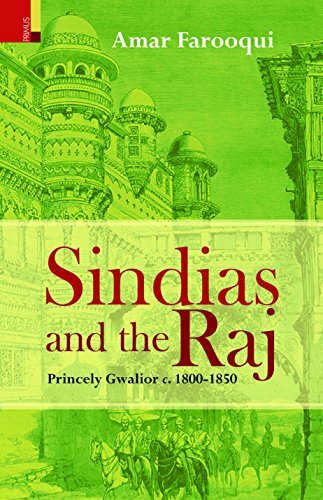 Sindias and the Raj is a study of the Sindia state of Gwalior during the colonial period. It traces the history of one of the leading princely states of the British Indian empire, from its first major military encounter with the British at the beginning of the century, to the eve of the Revolt of 1857. In doing so the book explores the fascinating factional conflicts at the Gwalior durbar and the connections these had with the politics of the powerful Sindia army. It argues that the colonial subjugation of Gwalior was a long-drawn process spread over nearly five decades and was not sufficiently achieved until the late 1850s-certainly not in 1818, as is often assumed by standard histories of the state. This resistance was largely due to the very strong tradition, in the Gwalior territories, of opposition to colonial intervention, as seen in a series of popular uprisings during the first half of the century culminating in the events of 1857-58. The tradition was reinforced by the assertiveness, vis-a-vis the East India Company, of the dominant section of its ruling class which drew strength from a formidable fighting force comprising soldiers who upheld the legacy of the fierce turn-of-the-century Anglo-Maratha military conflict and which was sustained by a resilient economy that profited immensely from opium'smuggling. These are all linkages that have hitherto remained unexplored. Sindias and the Raj also examines the political economy of princely Gwalior, while paying close attention to the responses of various classes in the state to colonial intervention-responses ranging from outright collaboration to armed conflict. It also attempts a reappraisal of several facets of the history of Malwa in the colonial period including the history of the Pindaris, and the trade in Malwa opium. Amar Farooqui is Professor, Department of History, University of Delhi. He taught history at Hans Raj College, Delhi; and has been Fellow, Nehru Memorial Museum and Library, New Delhi.